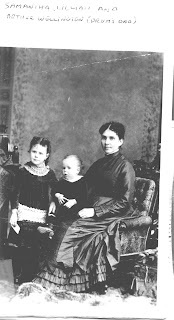 Samantha Rixon, or Mattie as she was known, (1856-1929) learned the importance of family early in life. When Mattie was a teenager, her mother moved away, leaving her and her younger brother, Phineas, to be brought up by their grandparents. Both children were probably illegitimate, and their father was not around. Mattie with Lillian and Arthur W.
The children grew up in Cramahe Township, Northumberland County, Ontario, a rural area near Brighton and Lake Ontario. Their grandfather, Thomas Rixon (1793-1876), who was originally from England, worked as a carpenter and farmer. Their grandmother, Betsey Thompson (c. 1804-c.1872), had already brought up 12 children, but she was still willing and able to care for her two grandchildren. Around the time her grandparents died, Mattie moved in with her married aunt, Ormacinda Rixon Fennell. Once again, a family member had come to her assistance. In 1879, Mattie married John McFarlane Forrester1, nicknamed Jack. He was the son of a Scottish-born farmer from Melrose, in Tyendinaga Township, Hastings County, Ontario. The couple settle up housekeeping in a log cabin on the Forrester family farm. A year later, Mattie gave birth to twins, a boy and a girl. The boy, named Arthur, did not survive, but Lillian May2, the baby girl who was one day to become my grandmother, was placed in a box behind the woodstove to keep warm. Jack was one of seven children, and land in Ontario was becoming too expensive for him and his four brothers to buy farms of their own. The Forresters agreed the best the solution would be for everyone to leave Ontario and start over on the western prairies, which were opening up to settlers at the time. The Forrester brothers and their father bought adjoining 160-acre lots near Emerson, Manitoba, close to the American border. Farming in Manitoba was quite different from life in Ontario. The Forrester farm in Ontario had been fairly small and hilly, and the family had raised mixed crops and livestock. Now they were farming grain on the vast, flat prairies. Winters were longer and much colder, but the soil, subject to periodic flooding by the Red River, was fertile. And although two of Jack’s brothers moved to nearby Winnipeg to pursue careers there, those who remained in Emerson could count on each other to help with the farm work and enjoy social get-togethers. 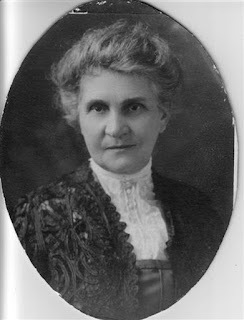 Mattie and Jack raised six children: Lillian May, Arthur Wellington, John MacFarlane, William Drummond, Lulu Elda and Jessie Jean.3 According to her nephew Charles Reid Forrester, Mattie was devoted to her family. In a memoir, he wrote: “Aunt Mattie … had been a school teacher in Ontario whose whole life was now devoted to caring for her family, milking cows and making butter, raising poultry, sewing, gardening and the thousand and one tasks incidental to running a farm home. Other details of Mattie’s adult life on the farm in Manitoba come from a privately published book written by her nephew Charles Reid Forrester. I found the letter she wrote to my father in his photo album. 1. "Ontario Marriages, 1869-1927," index and images, FamilySearch (https://familysearch.org/ark:/61903/1:1:FMJS-B42 : accessed 8 June 2015), John Mcfarlane Forrester and Samantha Rixon, 26 Jul 1879; citing registration, Shannonville, Hastings, Ontario, Canada, Archives of Ontario, Toronto; FHL microfilm. 2. "Canada Births and Baptisms, 1661-1959," index, FamilySearch (https://familysearch.org/ark:/61903/1:1:F2KY-L6B : accessed 8 June 2015), Samantha L. Rixon in entry for Lilian May Forrester, 11 Oct 1880; citing Tyendinaga, Hastings, Ontario, 11 Oct 1880, reference 520; FHL microfilm 1,845,398. 3. “1901 Census of Canada”, Manchester, Provencher, Manitoba; Page: 3; Family No: 25, Ancestry.com (http://www.ancestry.com: accessed 8 June 2015), entry for Samantha Forrester; citing Library and Archives Canada. Census of Canada, 1901. Ottawa, Ontario, Canada: Library and Archives Canada, 2004. http://www.bac-lac.gc.ca/eng/census/1901/Pages/about-census.aspxl. Series RG31-C-1. Statistics Canada Fonds. Microfilm reels: T-6428 to T-6556. 4. Charles R. Forrester, “My World in Story, Verse and Song”, printed by Friesen Printers, Altona, Manitoba, 1979. 5. “California, Death Index, 1905-1939”, database, Ancestry.com (http://www.ancestry.com: accessed 8 June, 2015), entry for Samantha Forrester; citing California Department of Health and Welfare, California Vital Records-Vitalsearch (www.vitalsearch-worldwide.com). The Vitalsearch Company Worldwide, Inc., Pleasanton, California.